Every now and then, we’re asked to build an itinerary for clients coming into northern Norway, and the travel agent or tour operator tells us, “These are very high end clients and they require 4-star accommodation”, or 4-star meals, or some other kind of 4-star thing. That’s perfectly ok, because excellence in service and products is important to have. But here in the far north, we’re a little short on Armani suits and white gloves. You’ll find lots of Bergans coats and Ulvang wool socks, and snowmobile suits for sale pretty much everywhere, and lots of people debating whether Ski-Doo or Arctic Cat makes better snowmobiles (leave your own preferences in the comments, I’m not getting in the middle of those discussions). And you’ll also find some delightful surprises, like a chance to eat a decidedly elegant dinner out in the middle of nowhere at a husky farm, where one of the owners happens to also have his professional kitchen. But we’ll leave the big palaces and tony hotels to the folks down south, thanks. Alta does have some 4-star experiences of its own, and interestingly enough we have so many of them (in my opinion) that it is easy to not see them sometimes. You won’t find them in a shop or restaurant or hotel. You have to go outside. And once you are outside, slow down, open your eyes and look around. Everywhere you look, there’s a snow-capped mountain glowing pink in the morning sun, or a bubbling stream in springtime pushing around and past the remnants of the winter’s ice. 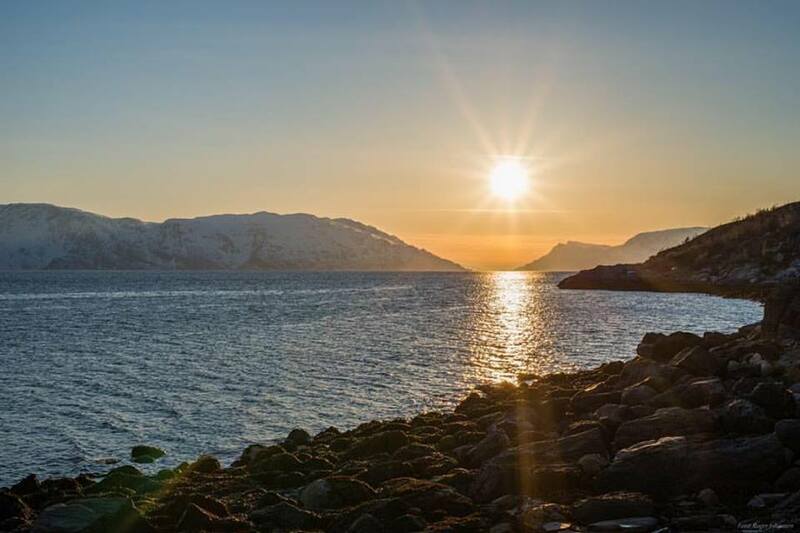 Or a glorious sunrise just at the edge of town – just an ordinary, 4-star start to the day here in the arctic wilderness. Photo by Roger Johansen. Marianne Knutsen shared it on the Visit Alta Facebook page. She posts a lot of really nice pictures of the world around us here; if you would like to see them every day, take a look at our Facebook page and the Visit Alta page, or follow her on Instagram (#northAdventureAlta).